Canadian metal trio CAULDRON to release 5th studio album “NEW GODS” in Europe via Dissonance Productions! Canadian metal trio CAULDRON will release their long-awaited fifth studio album entitled New Gods September 7 through Dissonance Productions (Europe) and The End Records (North America). For the follow up to their critically-acclaimed 2016 album In Ruin, Jason Decay (lead vocals/bass), Ian Chains (guitar) and Myles Deck (drums) together with producer Chris Stringer (Timber Timbre, Wooden Sky) honed and recorded the songs at Union Sound in Toronto for what would become New Gods. 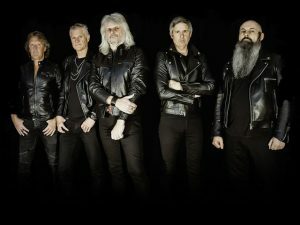 New Gods, the group’s fifth full-length studio record, once again promises a strong emphasis on songwriting and melody, complete with high-end organic production to match. “I am very proud of the songwriting, performances and production on this one, and it is definitely the most confident I have been in a finished album of ours. It is dark, it’s heavy and it has a very melodic sense of AOR. Most importantly, it still sounds very CAULDRON. I’m pretty sure people who were into In Ruin will like this one just as much if not more!” says Decay. Born from the ashes of genre-defining, critically-lauded GOAT HORN, the band known for being heavily influenced by Black Sabbath, Venom, and Judas Priest called it a day in 2006. But front man Jason Decay wasted no time in putting together CAULDRON to continue with his heavy metal vision. Hailing from Toronto, Ontario, Canada, CAULDRON has since then released the Into The Cauldron (2007) EP, as well as four full-length albums: Chained to the Nite (2009), Burning Fortune (2011), Tomorrow’s Lost (2012), In Ruin (2016) and the Moonlight Desires EP (2014). New Gods is set to be released September 7 through Dissonance Productions (Europe) and The End Record (North America). Previous PostNew album art by Claudio Bergamin (JUDAS PRIEST) revealed for upcoming Primitai album ‘THE CALLING’! Next PostPrimitai single ‘THE CALLING’ available to buy and stream now!! Seven Sisters “The Cauldron And The Cross’ official album artwork! New album art by Claudio Bergamin (JUDAS PRIEST) revealed for upcoming Primitai album ‘THE CALLING’!